A STRIKE at the gold mines of Sibanye-Stillwater got off to the worst possible start last night as an employee was shot dead and a number of others were taken injured in hospital. The company said in a statement that the strike which began with the night shift on Wednesday (November 21) had been “… accompanied by significant levels of violence and intimidation”. “It is with great concern that we report that one employee has been killed and a number of employees were seriously injured during the course of the night,” it said. All night shifts had been suspended at its gold operations. As for day shifts, mining would proceed where there was significant employee turnout, it said. 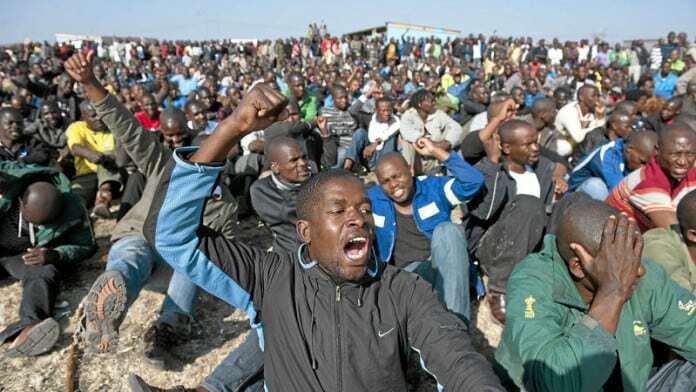 The Association of Mineworkers & Construction Union (AMCU), which called the strike last week after failing to negotiate a three-year wage package with Sibanye-Stillwater, represents the majority of miners at Driefontein, but only 34% of labour at nearby Kloof, and 37% of miners employed at Beatrix in the Orange Free State. According to a statement by the National Union of Mineworkers, the employee killed was one of its members in “a random attack” at Beatrix. “Those attackers started by closing the security gates, throwing stones at the bus that was transporting workers to work,” the union said labelling the attack as “a criminal act”. Sibanye-Stillwater spokesman, James Wellsted, said he was unable to verify at this stage to which union the deceased employee belonged. Any companies that have a “footprint” with Sibanye-Stillwater will be affected, Mathunjwa is quoted to have said. “This is not a threat,” he said. Lonmin already announced plans to reduce its workforce by 12,000 as economic mining at its generation one shafts ceased, most likely over the next three years. Some 2,000 miners have been retrenched this year. Sibanye-Stillwater yesterday welcomed a Competition Tribunal approval of the merger which also called for a six month moratorium on further job losses at the Lonmin operations. Asked yesterday if it was prudent to take union members on strike only weeks ahead of Christmas, Mathunjwa told journalists: “Does exploitation stop at Christmas?” Employees participating in the strike would face a work-no-pay rule. NUM employees currently participating in the third week of strike activity at the premises of South Deep, a gold mine on the West Rand owned by Gold Fields are also facing no pay this Christmas. “The current wage agreement reached with NUM, Solidarity and UASA is again well in excess of inflation, but takes the longer term sustainability of the gold operations into consideration,” it said. Interestingly there is no mention of the police by Sibanye-Stillwater, despite a murder having been committed, not to mention grievous bodily harm to a number of others. Is an internal disciplinary enquiry all the murder victim and the others get? Have we finally given up completely on the rule of law and due process?